British administration failed to prepare for times of inadequate rainfall so, when crops failed in 1770, no food supplies were available for the peasant farmers. Ultimately, the mass starvation of Indian peasants resulted from poor government administration. In the summer of 1770, the northeast of India, a region we now recognize as Assam Bihar and Bangladesh, experienced a famine that affected the entire area. By the end of that year ten million of the residents had died from starvation. The explanation given by the ruling authorities was that the tragedy was due to natural causes, but a closer examination of the circumstances associated with the sudden loss of rice, the principal food of the native people, revealed that the tragedy was due to two things: first, ignorance of rice agriculture on the part of the ruling authorities and, second, removal of the basic necessities of life by the same rulers in order to export or sell the rice and make a profit for the British government. At this time in its history Britain had no clear policy for its relations with colonial subjects other than to maximize its exploitation of local natural resources. The East India Company was the ruling power in India at the time of the famine. Its work in that country dated from 1600 when the British government gave it the right to capture and control as much of India as they wished. Gradually they expanded their territory until they were the effective if not the official government of the whole country. Numerous trading posts were established along the east and west coasts and a large number of people came from Britain to look after these trading posts. The largest ones were in Calcutta, Bombay, and Madras. A successful military campaign in Bengal by the British leader Robert Clive in the year 1757, in which the local emperor was defeated, gave the East India Company complete control over the best and most extensive agricultural land in all of India. Plentiful supplies of water from the Brahmaputra and other rivers coupled with extensive tracts of flat, rich, alluvial soils enabled this part of India to sustain a high density of population. Summers were hot, ideally suited to rice cultivation. In addition, every summer brought the monsoon rains, high levels of rainfall that ensured adequate supplies of water for the paddy fields. If the two causes of the tragedy are examined in more detail, the way that events unfolded become clear. The monsoon rains were always the key to successful cultivation of rice in Bengal. They arrived in onshore winds from the sea early in the hot summer months and they persisted into the fall when a reverse, cold, dry flow of air from the continental interior took their place. These gigantic movements of wind systems affected a much wider area than Bengal and it often happened that climatic changes in more distant places delayed the arrival of the summer rains, even causing an almost total absence of rain in some years. Two years before the famine, one of these monsoon anomalies began to appear. In 1768 there was a partial shortfall of rain. As a result, there was a reduction in the amount of rice harvested and in the following year there was even less rain and therefore a correspondingly smaller harvest. By September of 1769 there was a severe drought, and alarming reports were coming in of rural hunger. Early in 1770, reports of widespread starvation began to arrive at the East India Company Headquarters and they were followed by news of a rapid increase in the number of deaths. In the midst of the developing tragedy, local authorities maintained a strict control over agricultural output. Their income depended on either the sale of the rice they demanded from the local small farmers or on the taxes they levied on the people producing the rice. The people, however, who decided who would benefit from the harvested rice were unfamiliar with rice farming. They knew almost nothing about the vicissitudes of the monsoon rains and they were equally ignorant of local customs, including the traditional ways of dealing with years of drought. It was normal practice among the people of this area to have some rice in reserve because they knew that on occasion they would experience the kind of situation that developed in 1768 and 1769. Thus, they had a reserve of rice to cope with bad years. The British rulers made no arrangements for some rice to be kept for emergencies. Worse still, they prevented the local residents from having such a traditional reserve. As conditions worsened in the early months of 1770 and the death toll mounted the only response from the local authorities was that a natural disaster had occurred and nothing could be done about it. It is even more astonishing that the leaders of the East India Company, educated people who had come from England where humanitarian concerns for neighbors in distress was almost instinctive, could be so indiffer ent to the suffering that was taking place all around them. Instead of reducing demand on the harvest of 1769 and using all of it to provide emergency food supplies for the starving residents, they went in the opposite direction and increased the demand on available supplies of rice while continuing to increase the tax on the harvested rice. All the authorities cared about was the need to demonstrate to the British government that they made a profit year by year. If natural conditions reduced the harvest then, in their minds, the obvious thing to do was increase the tax on people so that the profits would remain at a high level. That is what happened. From the beginning of their control in Bengal, the Company had raised land taxes and trade tariffs up to half of the value of the agricultural produce. In 1770, with millions already dead from starvation, it raised these taxes and tariffs by 10 percent so that their profits would remain high. Famine was everywhere in 1770. Peasants tried to sell their possessions, even the ploughs and bullocks that they would need for their survival in the future. The price of rice, their staple diet, kept going up, and soon nothing that they could sell would pay for enough food. Children were sold to anyone who would buy them and some of them ended up as slaves in European and Indian households. Conditions deteriorated to levels of desperation that give rise to cannibalism and, at the same time, to an increasing spread of disease. At first the starvation and rate of death was in the rural areas, where the population as a whole depended on the rice crop. Then, as out-migrations accelerated, most people headed for the capital of Calcutta in the hope of finding relief there. There was little for them there and soon the streets of that city were full of dead bodies. One or two members of the East India Company were so moved by the horror of the situation that they left the country and went back to England. Later they recounted the events that had made such an indelible mark on their memories. They had seen human corpses mangled by hungry dogs and by jackals and vultures. When the situation became too great a danger to public health the Company employed a hundred men to pick up the dead bodies and throw them into the River Ganges. As a result of the famine, large rural areas were depopulated and allowed to revert to natural jungle. Many cultivated lands were completely abandoned. Bengal, formerly the richest part of the nation, became destitute and the East India Company was no longer able to maintain its formerly profitable status. The British Government appointed a governor general to take charge and replace the Company. The famine had taken the lives of ten million peasants, about one-third of the total population of Bengal. The total may have been much higher; there had never been a census of the population and only the painstaking work of researchers in later years made it possible to confirm that the death toll was at least as high as ten million. The famine ended as quickly as it had begun. By the end of the year 1770 substantial rainfall ensured a plentiful harvest. The whole desperately tragic event needs to be placed in the context of previous and subsequent famines in India. 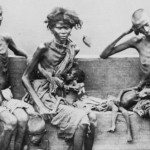 Altogether there were about twenty-five substantial famines in different parts of the country during the period of British rule, some in the far south and several in areas west of Bengal. Estimates for the total loss of life in all of these exceeded thirty million. None of them was as catastrophic as the 1770 famine. Famines were still present even in the final years before the country secured its independence from Britain in 1947. The last serious famine came in 1943, in the middle of World War II. Japanese forces had captured large areas of the south and the south east of Asia and they were advancing through Burma, at that time the largest exporter of rice in that part of the world. The British had encouraged the development of rice cultivation in Burma and, by 1940, was purchasing 15 percent of all India’s needs of rice from that country. Bengal, because it was so close to Burma, depended to a greater extent on Burma’s rice. About one person in every four of Bengal’s population relied on imports of rice from Burma. If anything happened to that source there would be another famine. True to its former neglect of retaining resources to cope with possible emergencies, the British once again had nothing in reserve. What military authorities did do, and what proved to be more disastrous than anyone imagined, was to introduce emergency measures all across the Bengal area. Large areas of rice cultivation near the Burmese border were destroyed in order to slow down the advance of Japanese armies, depriving the area of all local food resources in the process. At the same time, almost all the rice available was transferred to other parts of India and other theatres of war. The residents of Bengal were told that they had to cope with less rice because so many of their agricultural areas had been destroyed. In October of 1942, the whole east coast of Bengal was hit by a powerful tropical cyclone and areas of land as far as forty miles inland were flooded. The fall crops of rice were washed away and lost. Small quantities of what was already a reduced harvest, the part of the harvest that always had to be retained as seed for planting in the months of winter that followed, had to be consumed for food. As the hot weather of 1943 appeared and there was nothing to eat because nothing had been sown in the winter growing season, famine appeared and before the year was out four million had died. The military authorities had made no provision for food emergencies. Furthermore, all the military commanders in that region were concentrating on the war and gave little attention to domestic issues. The government of India tried to get help to the stricken areas but no one seemed to care in far away Britain at a time when World War II was at a peak of activity. Subsequent records of rice production for the year 1943 revealed that there was enough available to prevent starvation if only the military commanders had chosen to divert supplies of rice to the impoverished peasants. In the late 1990s, Indian author Amartya Sen was awarded a Nobel Prize in economics for his studies of the Bengal and other famines in India. His conclusions were a damning indictment of British administration in India. He showed that rice production in India during the years 1941–1943 were pretty much normal and were sufficient to provide food for everyone. The totals, year by year, varied only slightly from the normal: 1940, eight million tons, 1941, seven million, 1942, nine million, and 1943, eight million tons. Sen was convinced that the 1943 famine was caused, not by a shortage of rice, but by the removal of supplies from the stricken areas to meet the needs of fighting troops. His thesis went on to show that, while malnutrition and hunger remained a common condition in India, no major famine occurred in fifty years following independence. Yet, in those years, 1951–2001, the total population grew from 360 million to more than a billion. By contrast, in one fifty-year period of British rule, 1891–1941, the population only grew from 287 million to 389 million. Sen selected the fifty years from 1951 because the immediate aftermath of independence led to considerable strife and disruption of agriculture.